The survivor, the victim, the recovering addict, the overcomer, and the high achiever all have a fear in common–going back! If you fit into any of these categories, I’m here to tell you that is not God’s purpose in your life. I know first hand. When we survive or recover, we don’t have to fall into depression, or regress back into what was hindering us before. The suffix ‘Gress’ means to take a step. God does not want you to take a step back–He wants you to make PROGRESS! I don’t know who I’m writing this for, but I felt that someone needed to read it. When Jesus raised a man from the dead (John 11), the man didn’t die soon after that. He lived a long time! When Paul the Apostle made the lame man to walk in Acts 3, he didn’t go back to lie in his bed when Paul left town! You overcame because you fought. You accomplished because you worked hard. You withstood because you prayed. You got better because you worked on yourself. God will not take that away. You lose your blessings when you believe the lies that say you won’t amount to anything! 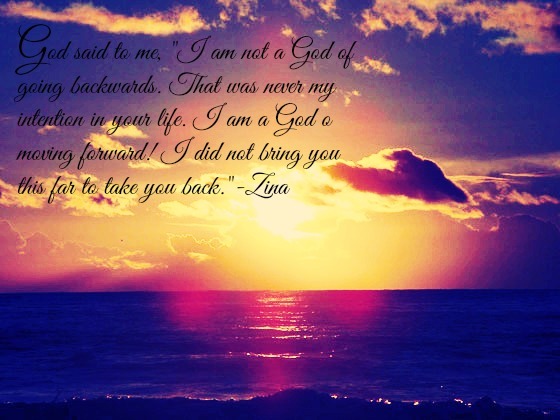 Zina Hermez authored the book Not Without God: A Story of Survival and created the Spinal Injury Solutions! website. Zina works as an English as a Second Language Instructor and has been an educator for more than fifteen years. Her thousands of students have been from many parts of the world, and she writes articles on faith and overcoming challenges. Her stories have been featured in Christianity Today, guest posts, newsletters, medical journals and other publications. To learn more about Zina visit http://zinahermez.com. Thanks Zina. Nicely written. Indeed I tick several of those boxes. I’m always grateful to read your inspirational messages.This one in particular really spoke to several of my weaknesses. I hope you and family are doing well. Next Next post: What will YOU overcome?